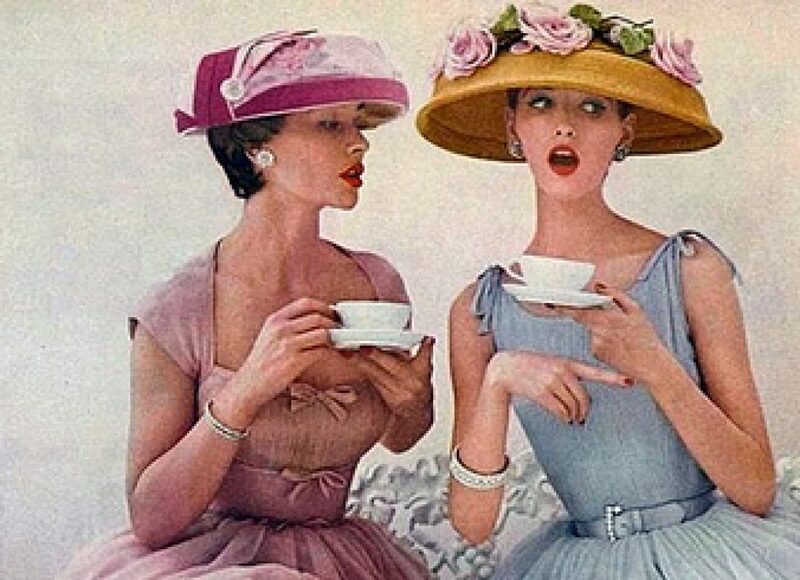 Spring is here, spring is here- life is skittles and life is beer…….I’ve been very busy lately replenishing the wardrobe that grew dull as it sat in the off-season totes. Absence didn’t make the heart grow fonder for all my clothes, sadly. So I’ve whipped up a few new things. It’s another 2-fer! One for work and one for leisure. I finally got around to Mccalls 6333- a racer back top with side panels that you can’t see on my fabric. Look at those limbs! So pale and scratched up by tiny pups. This photo shows you my dedication- it’s not my best angle, but the racer back with elastic is the high point of this pattern. Whoo! My photo slave should have manned the steamer for me! I finished all my facings with burgundy bias tape- a hint of color to tease, don’cha know. 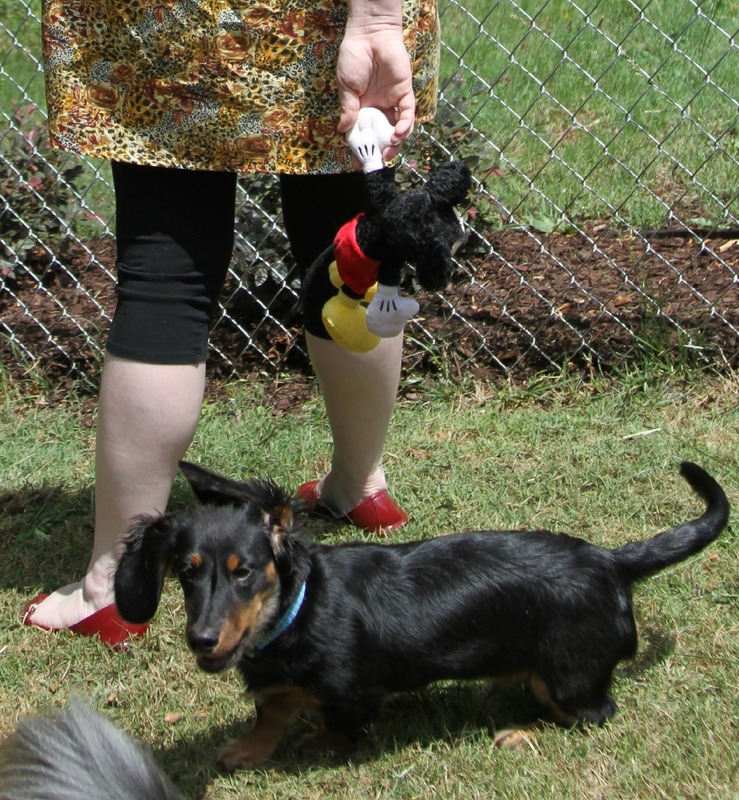 Speaking of teasing- here’s Helmutt, our newest blog stealing dachshund. Really I dress for 2 places- work and Disney. This will be perfect for the family trip in fall! Now whats next? Ah- Vogue 1236. Pattern Review named this one of the best of 2011. See how timely I am? I have a hobble skirt almost done, too. This is similiar enough to sing the Sesame Street song, but I think you’ll see the differences! Here we are- restyled and ready for take your cheetah to work day! Did you notice the bushes? The other side of the yard has 5 years less growth- I was trying to make an ironic statement about mans fallibility the sun shifted, so we moved. I am still in an anti-sash mode- so I belted her instead. All these bust pleats get mighty poofy, don’t they? Two years ago I feared pleating- now I’m a chalk wielding pleatin’ beastie. It’s nice to be able to say you’ve improved a bit- ah! Thats it! Thats my shrubbery metaphor! MY growth. Oh, so deep. I’m getting woozy with my own cleverness. Admire the pup some more- he’s cute, but so rotten- he’s chewed so many things we are renaming him ‘What the Helmutt’…..
Ok, get ready for the glare- here I am without my cardy! Yes, these 2 pieces were not complicated, no new ground was broken- but they are helping me on the road to sensible, useful sewing. Oh, dear God?! Photo credits: pattern review, meadhawg, little me. All images remain the property of their original owners. Sash ties seem to migrate on me to just under the bust- the belt gave me more structure! I really like both of these! The fabric is so you, too. I’m with you on not liking sashes. To me they always look a little too homemade, in a bad way. I’m sure there’s a way to make them chic, but I don’t know what it is. I agree – I think sashes have too much of a homemade vibe going on – plus the solid belt grounds the fabric pattern. They both look great and I don’t think the pleating is too poofy at all. Mickey looks ready for a vacation in the sun! My fabricusually needs a grounding element! Im not sure how to swing a sash either! I think sashes only work when you actually turn them into belts — I use really stiff stuff that is intended for the tops of curtains or blinds and stick a buckle on it. Love these dresses. You nailed it!! Want to head to the park with me? Lovely. 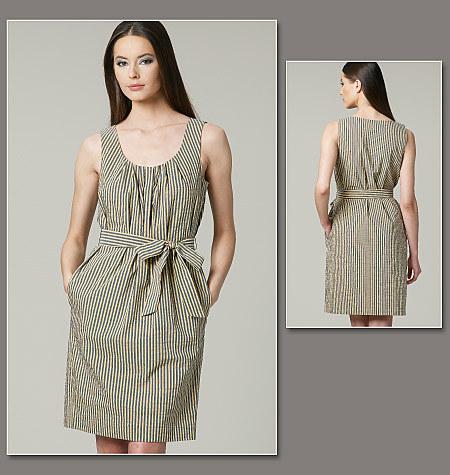 Great racer back on the top and I love the dress with the cardi and belt – looks very chic. Helmutt is so cute. Thank you- you know how a pup enhances ones stylishness! Love them both! Makes me excited to get some Summer sewing done. I’m digging the pleats. I made a blouse like that a while back. Think I should revisit it. I also Iike your styling with the leggings. Thank you- the pleats really dressed it up for me! Two cute makes that will be so cool for summer wear. They fit your personality – and body – well! Thank you! Dont know why I waited so long to make these!? Who is that funky cool girl??? 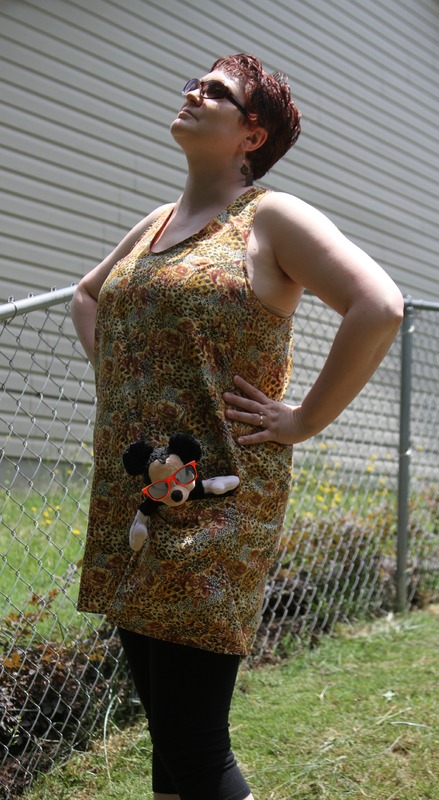 WOW…leggings and attitude and Mickey in your pocket…so simple and so effective. now you need a couple more for summer! Good job! cute top. love the racer back. oh and the new puppy dog. btw I have racer back envy. they make me look like a Russian shot putter. Racer back- great for slopy shoulders! Wow, Anne, you have taken both these patterns to a new level – they look fantastic! I would never have thought the racer-back would make such a cute dress/tunic thingy. And I’ve avoided the pleated-neck shift (even though I own the pattern!) because I’m so wary of my waist. Lovely summer goodies! Boxy waists make me nervous too- Im hoping the belt will leash everybody down! I really need to pull this pattern out and make it up. Each summer I threaten to do it, and then get sidetracked. Your new threads are lovely! Lets keep 2011 alive in our hearts! I raise my sunblock 75 to you in a toast! I’m still pretty pasty and I live in permanent summer here in Singapore, so I think it’s a cool look! I love the racer-back top and that dress is very cool (I would live in it here!) Your pleats look so sharp – there is no trace of your fear whatsoever! Also, hurray to the awesome print! Thank you so much- you know I love the faux animal prints! Sensible sewing should always include cheetah prints. These pieces are lovely on you. Also, I’m in total agreement with you about sash migration problems; belts are my friends.